MENTOR, Ohio - Jan. 2, 2017 - PRLog -- SMART Recovery will host Reid K. Hester, Ph.D., for a fascinating overview and discussion of recent scientific findings on addiction treatment and support, including work from his own lab as well as that of others. There are valuable lessons to be learned and new strategies that have real implications for people struggling with their use of alcohol, drugs and behaviors as well as the professionals and families who want to help. Dr. Hester is the Director of Research at Checkup & Choices and creator of SMART's CheckUp & Choices (http://www.smartrecovery.org/checkupandchoices/) companion web course: . His professional career has included clinical work, program consultation, research, and training in empirically supported approaches to substance abuse treatment. His research focus has been in the development of digital tools to help people with alcohol and drug problems. Reid Hester has been the senior editor of 3 books and over 60 other publications in the area of substance abuse prevention and treatment. He was a recipient of 2 Tibbets awards for excellence in Small Business Innovative Research (SBIR) in 1997 and 2006. He has been a technical adviser and consultant to the World Health Organization (WHO), the NIAAA, and the National Institute on Drug Abuse (NIDA). He received his Ph.D. from Washington State University in 1979. 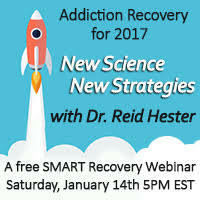 Start the New Year out right and kick-start your own recovery with this FREE webinar -- as always, open to SMART participants, friends, family members, professionals, and the general public!